Having not posted all week, I’ve written two posts today! So if you’re looking for my SAL post, just scroll down, it’s before this one! Tomorrow it’s my Embroiderers Guild meeting and we have started another round of the travelling sketchbooks. 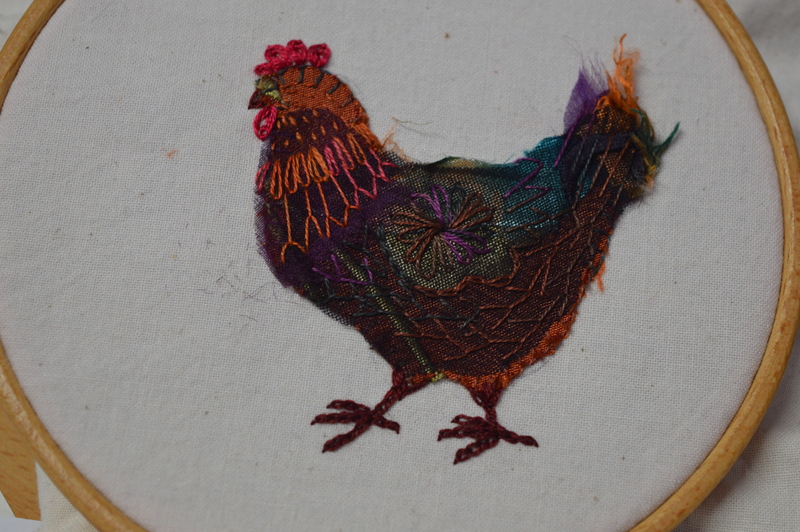 I’ve had two months to embroider a chicken but of course I only started it on Friday night! I found an outline of a chicken on the internet and my daughter kindly did her stuff on the computer so it came out the size I wanted instead of A4. The actual chicken is just under 3″ tall, a nice size for a couple of evenings embroidery. 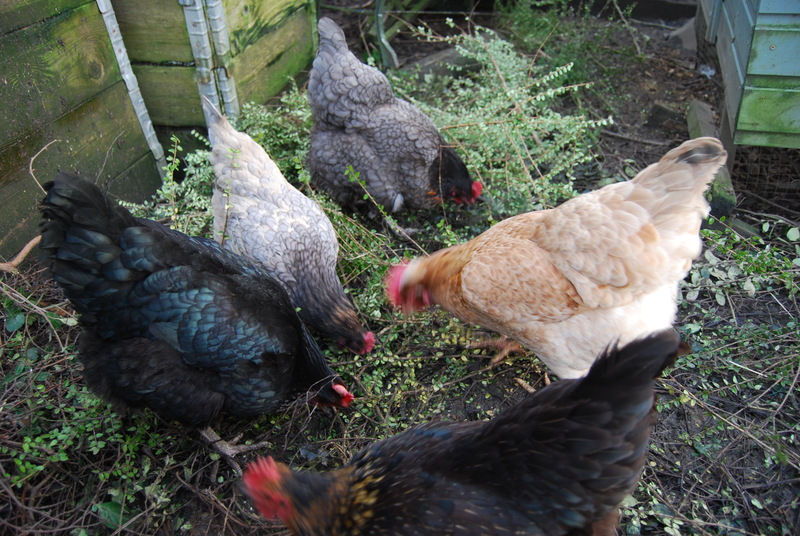 I decided to base it on Florence, my favourite ever chicken, she was beautiful, a copper black chicken, so her feathers were a gorgeous metallic black with shades of purple and green, then her neck was flecked with copper. She used to follow me round in the garden and would sit on my knee whilst I had a cup of coffee. I’m beginning to get a bit of a stash of embroidery fabrics and threads, helped by the guild raffle where everyone brings a little something of one colour and all the goodies are divided into three baskets. I won a brown basket last month which was perfect for this as there was silky fabrics, threads, buttons, beads, all sorts of goodies! 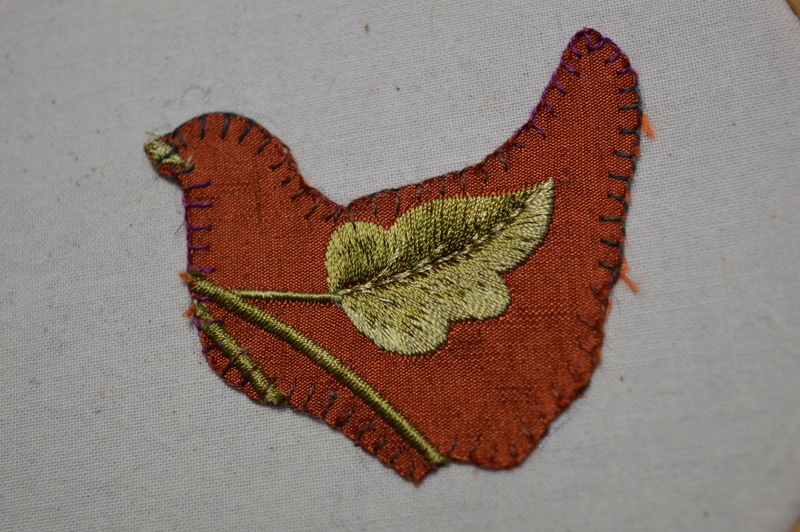 I found a piece of russet coloured furnishing weight silk which I used for the basic chicken shape, I positioned it so a flower was over the wing, this works well, the only downside being the stem going across the front. I cut up little pieces of purple organza, teal sari ribbons including some that were frayed which were perfect for the tail. To bring it all together I overlayed it all with a scrap of black lace tulle. Having sorted my fabrics I had to start embroidering. I blanket stitched around the basic russet silk first to help give it a firm base. I then embroidered over the tulle and organza using DMC variegated threads. I used basic stitches like chain stitch and fly stitch on the neck, lazy daisy and fly stitch on the wing and feather stitch on the breast (I had to include feather stitch!) The head has some simple running stitches and straight stitches on the tail. Chickens legs are pretty sturdy things so I used chain-stitch to give a heavier line. I think Florences legs were yellow but I couldn’t find a yellow that looked right so she’s got brown legs now. This morning I added a few beads for a bit of sparkle and texture, I’ve put interfacing on the back, so all I need to do now is blanket stitch round and stick it in my friends sketchbook, just in time for tomorrow. I’m really pleased with this little embroidery, I like the slightly ‘tatty’ edge effect. Doing these travelling sketchbooks does push you to find your own style as you have to embroider something on a given topic each month. I’m linking up with Kathy’s Quilts for Slow Stitching Sunday, why not follow the link and see what everyone else has been stitching. 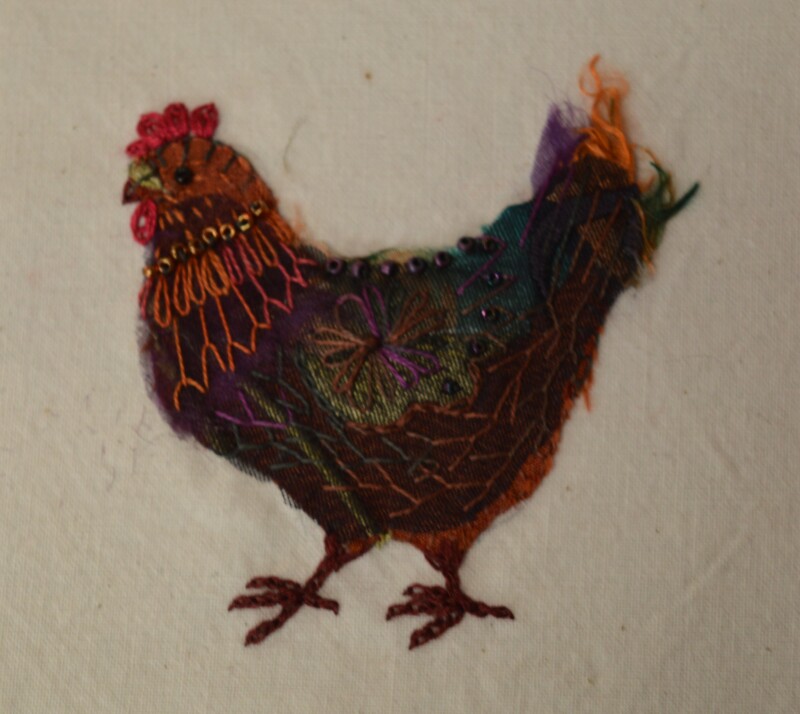 This entry was posted in embroidery, Serendipity, The Travelling Sketchbook and tagged Chicken embroidery, Chickens, embroidery, Travelling Sketchbook. Bookmark the permalink. What a great design! I love the way you’ve achieved this effect. Your friend will be so pleased with it. Well done, it looks fabulous! You are brilliant! Seeing each photo I thought “Oh that’s so lovely” and couldn’t believe how in each photo the chicken was more and more beautiful and detailed! Wow! Your chicken turned out beautiful! 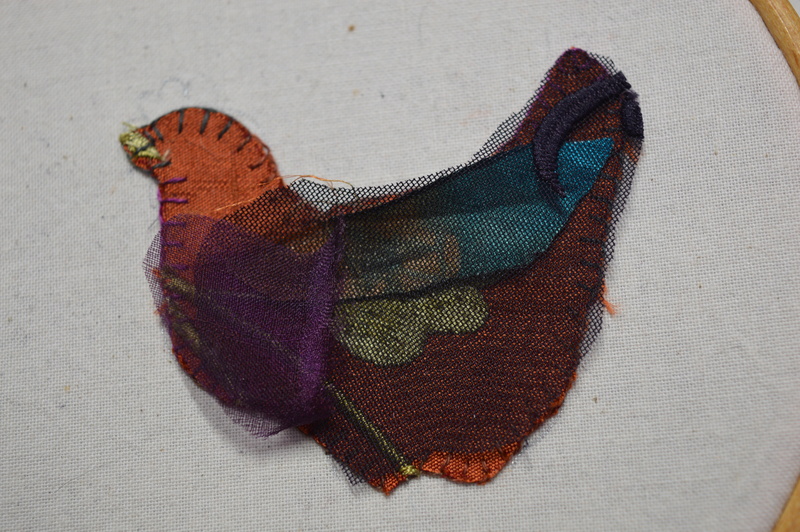 I love how you showed the progression of how you made the chicken with the different layers of fabrics and threads. Whoever gets the chicken will love it too! Oh my gosh, what a beautiful job you did with this little chicken! I love it. She’s beautiful! The tatty effect is perfect, and the beads add that final, little touch of bling. Your chicken is wonderful, and I love how she is based on your real life favourite! Thanks for sharing your process. I’m in love with that chicken and how you got the coloring achieved, so creative, you! She’s gorgeous. You’ve achieved a ‘real chicken’ with your scraps and stitches, by which I mean you’ve captured the essential chicken, a piece of real artistry. I can almost hear her! Absolutely fascinating! Your chicken is beautiful and so creative. I love your chicken, especially the legs. You’ve captured a fine example of a Rhode Island Red Cross. Your chicken is absolutely darling! I love all the layers of fabric and all the stitches highlighting different areas. Abso-lute-ly Brilliant!! I think Florence has returned to you. She turned out wonderfully! Beautiful work! This is just beautiful. I’m so glad you showed us each stage, and i love the overall effect. I love how the materials and stitches have all worked together perfectly. I love this – the unfinished edges give good effect of feathers. It’s beautiful – so creative.